AccuTec Products is a bathroom partition manufacturer that was founded in 2006 in California. Their bathroom stalls are available in a variety of colors with material options that include HDPE solid plastic material, solid phenolic and plastic laminate. 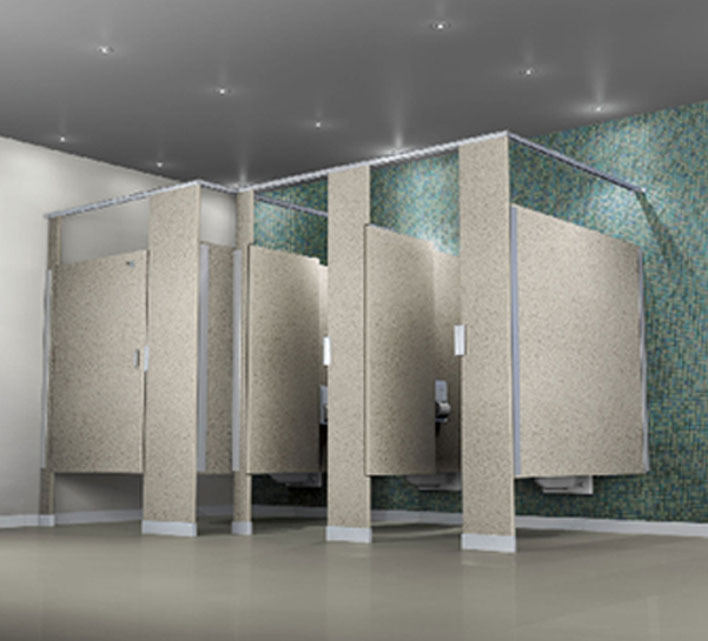 All of AccuTec’s bathroom stalls are available for mounting as floor anchored with overhead braced installation, ceiling hung, floor anchored, or floor to ceiling anchored. This manufacturer offers fast shipment with most orders shipping within 2-4 business days. Since AccuTec is located in California, customers receive quick shipping to West Coast states including California, Washington, Oregon and Nevada. HDPE stalls and partitions are solid plastic toilet partitions made from 1” thick HDPE high-density polyethylene polymer with homogenous color throughout. They have a 15 year manufacture warranty against breakage, corrosion and delamination. The thick HDPE high density polyethylene resin gives the bathroom stalls a clean solid look with homogenous color throughout. Solid plastic material is perfect for showers, dressing stalls and public places where high traffic is expected such as schools, parks, gyms, hospitals, sport arenas and airports because they will not rust, delaminate, or easily scratch. Plastic laminate stalls and partitions are constructed of high pressure plastic laminate and come in a variety of color options including Wilson Art, Formica, Pionite and Nevamar. These toilet partitions are constructed on 1/16” high pressure plastic laminate. They meet or exceed the performance requirements stated in the NEMA publications bonded under pressure to a 7/8” solid 45 lb density industrial grade board core. Finished panels are 1” thick with two face plastic laminate applied over the self-edge banding. This material is preferred because it can be easily cleaned by wiping with a non abrasive detergent and damp cloth or a sponge. They are also a preferred material because difficult stains can be quickly removed simply by using a mild soap or detergent and a soft-bristled brush. Solid phenolic stalls and partitions are constructed of solid phenolic core with multiple resin-impregnated kraft, color and clear melamine surface sheets fused and pressurizes at a high tempature. This material is available in a variety of colors including Trespa, Arborite, Formica, Pionite and Nevamar. As with the HDPE material, AccuTec carries a limited 15 year warranty from the date of purchase against delamination and defects. Need Help Selecting the Right AccuTec Product? If you are looking to renovate an existing restRoom or have a new construction project requiring A new bathroom, we can help with the material selection process, layout, design and pricing.